After watching the 60 Minutes interview with Stormy Daniels last night, I'm convinced this whole affair is going to be a three-act play. Act One was the kickoff: Daniels lawyer tells media his client's story. It brews for a week and then explodes on 60 Minutes (which drew record ratings). Act Two: It's getting serious now. A lawyer for President Trump's personal counsel Michael Cohen is demanding that adult film actress Stormy Daniels and her lawyer retract "false and defamatory" statements after 60 Minutes aired last night. Stormy's lawyer Michel Avenatti, told CNN this morning that he's ignoring the letter and that he's going forward with the case. He feels that his client has enough evidence to prove her relationship with Trump, and to make a case in court against the liar-in-chief. This playful banter will go back and forth until it hits the courts. Trump's minions are doing their best to bully Daniels right now. 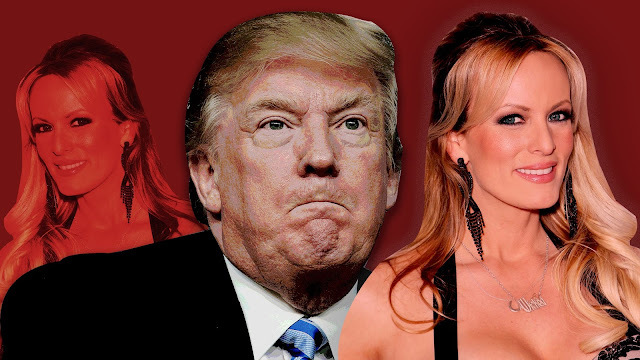 According to Daniels, the bullying started years ago when a strange man came up to her and warned her to leave Trump alone! It's unclear how long this second act will go on. The third act, of course, will be the trial and the results.